Take an already warming planet, stir in a dash of El Niño, and add a splash of melting Arctic ice. Voila! You’ve got a baked Alaska. The state has experienced a warm and wacky winter, with only one-tenth its usual snowfall and temperatures 10 degrees F above average. This lack of snow is especially problematic for a cherished tradition: the Iditarod, Alaska’s annual dogsled race. To avoid the tribulations of slushy mushing, a snow-bereft Anchorage is importing snow for the beginning of the race. An Alaska Railroad spokesperson told Alaska Dispatch News that 300 cubic yards of snow will be transported by train from Fairbanks — some 350 miles away. The imported snow will also be used for other wintery festivities that weekend, including a lesser-known race called the Running of the Reindeer, which involves a crowd of humans sprinting through Anchorage, trying to outrun reindeer bounding alongside them. 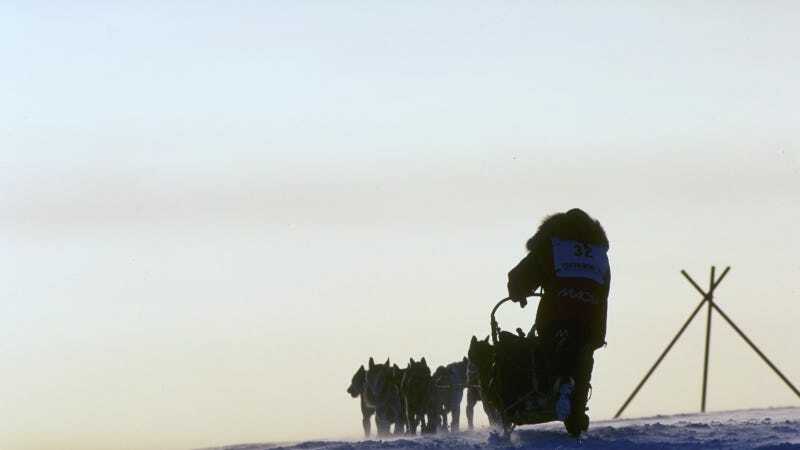 This marks the third year in a row that the Iditarod has struggled with snow. In 2015, officials had to reroute the race — twice. The year before that, melting snow resulted a barren, treacherous trail that caused injuries and knocked some mushers out of the race. Today’s Alaska is looking less and less like the winter wonderland of yesteryear.